That is a great great quote. It actually sums up Donald Juel’s “Messianic Exegesis” book which is excellent. Juel looks at it more from the angle of exegesis, and Evans from the historical angle, but it works for both. This thought process needs to be taught at seminary! Hey, thanks for your wonderful review on Evans’ Matthew commentary. I found it interesting. However, to your first “negatives” on genre I wish to comment that I think he sees the ancient text as biographical rather than a historical literature. However, he seems to see a hand of history in this biographical account. This impact of history is not in terms of its technicality but in the fulfillment of history in Matthew’s chosen protagonist, Jesus. Therefore, Evans certainly, did not discuss about the genre of the gospel; but he does not also sits on the fence on the matter. He does see the text as pointing to a character rather than an event in history. I think if Dr. Evans was to have written this commentary the way he wanted it, we could have had over a 1000 page of work to ‘devour’. But as you said in your last point “writing assignment;” he was certainly constrained on the pages to write just as it is in the business of writing. Therefore, a writer is usually left with the choice of what aspect(s) to discus as long as it fulfills the requirement of the project. 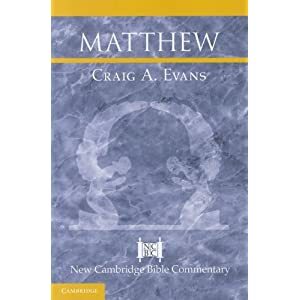 I am so sure that when given the choice to say more in this book on either the theology of Matthew or expound more on the Matthean use of the OT, he will go for the latter. He is so much in love with the use of the OT and other Jewish literatures in the NT. This does not mean he has no interest on the theology of Matthew. Therefore, as you have rightly said, he is defending the historical reliabiblity of the gospel and that he is not a close-minded fundamentalist. This is very true of Craig. I found him to be more of a forward thinking evangelical whom my respect for is unquestioned as his student.